LED bulb for your Singer Featherweight. No more burns from your light bulb! Finally!!! An LED bulb for your Featherweight and 301 (same bulb should fit both)!!! Stays cool. Has 'cat eye' connectors for better connectivity in your machine. Fits both black and white Singer Featherweight 221's. 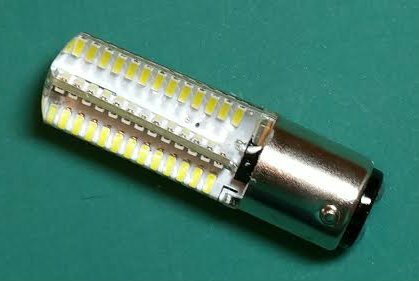 Additionally, the LED should perform better than a filament bulb in a portable machine, since there is no filament to break.